Aspen, CO – When you’re a little kid in a mountain town, hucking air and dropping into steeps is just what you do. As a little ripper in Crested Butte, you don’t even need a terrain park – the mountain’s natural terrain provides all of that. Crested Butte kids were as home dipping their tips into Headwall as they were walking to school in the tiny old mining town tucked away in the West Elk Mountains north of Gunnison, Colo.
Little Aaron Blunck was all of 18 months old when dad and grandpa (who started the Crested Butte Ski School) put him on skis. At five years old, he was already captivated by X Games. By age eight, he was competing. At 15, he won bronze in the inaugural Youth Olympic Games. But his lifetime passion for X Games is unbounded. 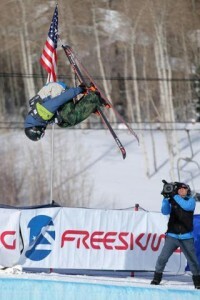 “When I was growing up that’s the one part of the ski season I would look forward to the most,” said Blunck. “For days I would do nothing but watch TV – my eyes glued to the screen, basing my whole life around X Games.” If he had a hockey game on an X Games night, mom was tasked to watch TV and relay important runs to dad, who was hockey coach, to pass on to Aaron. Growing up on one of Colorado’s gnarlier mountains, Blunck didn’t have a lot of park rats as friends. His buddies were big mountain skiers. And they tore up the mountain with little Aaron in tow. Over the years, Blunck would parlay those big mountain skills. His Youth Olympic Games medal grew into an X Games invitation. 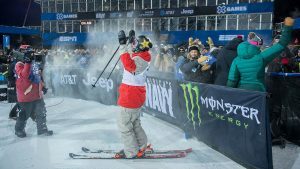 In the newly minted sport of Olympic freeskiing, he was one of the first picks by new sponsor The North Face as part of its pro team. He was seventh in the Sochi halfpipe behind teammate David Wise who took gold. 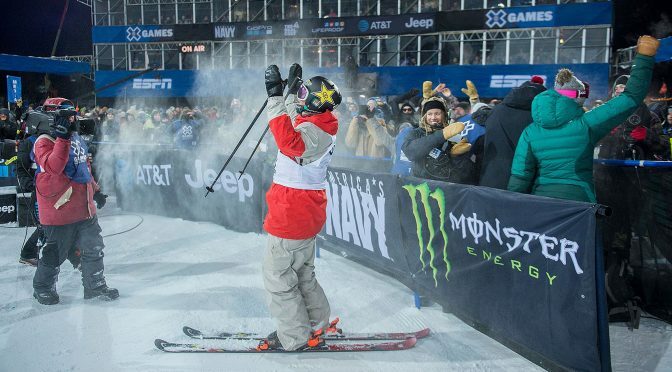 Last season he notched another breakthrough with a win at the U.S. Grand Prix in Park City. But if you’re a kid who grew up mesmerized by your sport’s version of the Super Bowl, there was really only one title that meant that much to you. A couple of Friday nights ago, Aaron Blunck was chilling at the start before his final X Games run in Aspen. The first run was a bit of a lackluster show for the field. Canada’s Noah Bowman was the only one of 11 skiers to ski a clean run. Blunck was well back in the pack. But it was also wide open for challenge. It was a tough pipe with steep, icy walls. He could have easily packed it in and downgraded his run just to go clean. But that wasn’t his style. Standing at the top looking down into the lights, memories of those Friday nights at the family home in Crested Butte – eyes glued to the TV – came rushing back. No stress. This was what he lived for. As the TV cameras rolled, Blunck pointed his Armada skis into the superpipe. First trick, a right side 720. Check. Next a switch 900 left side. Bango – that was the pivotal point. “After hitting that left side 900, I knew I had the rest of my run dialed in,” said Blunck. “I said to myself, ‘the run is yours – just go for it.’ It was autopilot from there.” Switch right side 1080 into another left side 900, capping it all off with a right side double cork 12. In his fifth year of trying, it was the first clean run he had ever landed. And it was golden! ipped around Crested Butte – the kid who had a dream. They remembered those countless Friday and Saturday nights eyes glued to ESPN. They learned names of tricks they had never even imagined. And they grew to love this dreamer who was unstoppable in his pursuit of fun. As his fellow competitors embraced him like brothers, Aaron’s eyes focused on his family in the crowd. “It was truly something very special to me,” he said.